Project Attraction: Most Luxurious Planned Development. Project Type: Exclusive community of 5, 8, 10 Marla & 1, 2, 4 Kanal residential plots & 4, 8 Marla commercial plots. – Gulberg Heights Is An Icon Of Class And Luxury! 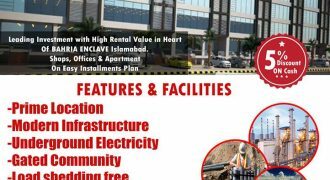 – Located In Gulberg Greens Islamabad On Islamabad Expressway. – Mall Plus Residential Apartments! Double Basements With Dedicated Parking For Residents. – Opportunities Like This Don’t Come Around Often – Studio, 1 Bed And 2 Bed Apartments On The 2nd And 3rd Floor Available! luxury apartments for sale at shelters arcade invest your money today & start receiving rent from toady onward on 50% down payment. so don’t waste time to take an opportunity, best time to invest in Enclave.